Chalky, opaque-looking white spots on the teeth are not uncommon today. Maybe you have them or perhaps you’ve seen them on the teeth of friends or family. Many things can cause white spots on the teeth. They can be a factor of nutrition, genetics, an excess of fluoride intake at a young age, or poor oral hygiene. 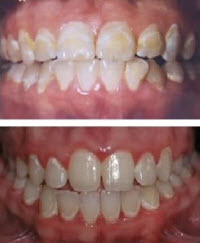 When undergoing orthodontic treatment, white spots can develop if plague is allowed to remain “around the brackets and along the gum line” for an extended period of time without proper brushing and flossing. Good oral hygiene is critical during treatment. Since the bonding material that glues the bracket to each tooth creates and air tight seal, you seldom see white marks underneath the braces but around the braces and along the gum line after braces are removed. When you ingest food and drink, the pH (level of acidity) can drop below 5.5. This is the critical threshold when cavities begin to occur. If the plague lies around the braces for extended periods of time, decalcification or white marks (beginning of decay) occurs. Very simple… brush your teeth, especially before bedtime. You don’t want plaque to remain around your braces and gum line all night long. Plaque collects underneath wires and around braces. Brush well to remove it all and check after brushing to make sure you got it all. Consider and electric toothbrush. They work great and do a better job than a waterpik which doesn’t remove plaque as well as brushing. Floss regularly to remove plaque and debris between the teeth. While white spots are not as noticeable between the teeth, it can be a problem. Preventive use of a prescription fluoride tooth paste or rinse, if indicated, based on your individual needs and brushing habits. Reduce intake of acid foods and drinks such as; sour candies, lemons, vinegar based foods, and acidic drinks such as soda, sports drinks, and lemonade. They increase the risk of developing decalcification or white marks if consumed on a regular basis. Keep in mind that hair and eye color are determined at birth, just like the color of teeth and susceptibility to decay is also unique to each individual. What causes white spots on teeth is different for everyone. At Greater Houston Orthodontics, our goal is to educate all our patients and parents on how good oral hygiene and diet impact your dental health during orthodontic treatment. Lets all work together to create beautiful smiles that last a lifetime!